ABC starts the Halloween season tonight (Oct. 24) with a night of spooky laughs. There'll be a little something for everyone when ABC celebrates the scariest night of the year with Halloween-themed programming. Haunting highlights (Oct. 24-31) include deliciously spooky recipes featured on The Chew, frightening laughs when the Bird-Kersees feel threatened by trick-or-treating kids on The Neighbors tonight at 8:30/7:30c, an entertaining costume party hosted by Mitch and Cam on Modern Family, and a chilling night of drama on 666 Park Avenue on Sunday, as Olivia puts the finishing touches on the Drake's annual costume gala. 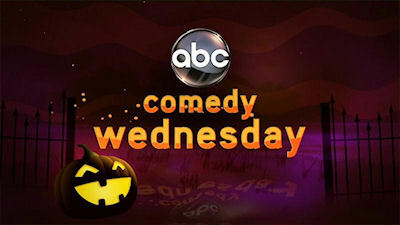 The fun begins TONIGHT with ABC Comedy Wednesday. We've seen three of the four episodes tonight and they are hilarious and great Halloween episodes! On an all-new The Middle at 8/7c, as Halloween approaches, the Hecks get quite the scare when Sue receives her learner's permit, and it's time for Frankie and Mike to teach her how to drive. But when a freaked-out Sue loses her nerve, she ends up running over Axl's foot, which could put an end to his high school football career and his hopes for a scholarship. Meanwhile, Axl looks forward to voting in his first election, and Brick undergoes an unexpected transformation when he eats too much Halloween candy. Then on the new comedy The Neighbors, since arriving on Earth, the aliens - led by the Bird-Kersees - have viewed Halloween as a threat and have set up a barrier at the gates of Hidden Hills to prevent children dressed in costumes from entering the community. The Weavers, on the other hand, are excited about their first Halloween in the suburbs and want to open the gates of the community to celebrate. They do their best to explain the ritual of trick-or-treating to the aliens. Meanwhile, Marty and Debbie's fears are realized when Amber, Max and Abby reject their family costume plans. On TV's #1 comedy Modern Family at 9/8c, Claire has overdone it in Halloweens past and the neighbors definitely don't share her enthusiasm, so this year she's being forced to tone it down and keep it "kid-friendly," and Phil has an idea to hold an open house on Halloween night. Meanwhile, Mitch and Cam host a costume party while contending with Lily wondering who her real mom is, and Gloria's pregnancy hormones are on overdrive, making her even more hotheaded than usual. And then on Suburgatory, when Tessa convinces Dalia and the KKK (Kimantha, Kaitlyn and Kenzie) to come up with feminist inspired Halloween costumes, she finds herself the interest of the infamous East Chatswin witch (aka Paula), played by guest star Rachel Dratch. As it turns out Paula isn't exactly what she seems. Meanwhile George and Noah dress up as each other, and Dallas invites George to be "Ken" to her "Barbie" -- but he declines, not realizing that she is asking him out. And next week on the Tuesday comedies, on Happy Endings, Dave and Alex go apartment hunting, but their inability to commit to a place puts their real estate agent (guest star Rachael Harris) to the ultimate test. Meanwhile, Jane takes negotiations to crazy levels when she helps Penny shop for a car; professional freeloader Max shows a cash-strapped Brad how to spend the perfect Saturday in Chicago with no money at all; and the gang celebrates Halloween dressed as the legendary Jacksons. Rob Corddry guest stars as the Car Czar. And next Tuesday on Don't Trust the B---- in Apartment 23, Halloween is June's favorite holiday, and even more so this year now that she is single! However when she discovers that Chloe plays elaborate Halloween "tricks" every year, June becomes consumed with stopping her before Chloe really hurts someone she might actually care about. Meanwhile due to a deep-rooted childhood fear of Halloween, James throws his annual Halloween "Positivity" Party. And finally, the Halloween mania concludes on Halloween night with the best of them all, It's the Great Pumpkin, Charlie Brown. In the classic 1966 animated Halloween-themed special, created by late cartoonist Charles M. Schulz, the gang celebrates Halloween with Linus hoping that, finally, he will be visited by The Great Pumpkin, while Charlie Brown is invited to a Halloween party. CBS has picked up full seasons for two rookie dramas: Tuesday drama Vegas and Thursday drama Elementary. Only the fate of new comedy Partners remains to be seen after the initial 13 episodes, as new drama Made In Jersey was already canned (it was the first new series canceled on any network). As for the other networks, NBC is likely going to give five more scripts to Guys with Kids, while ABC's new dramas 666 Park Avenue and Last Resort is looking to have two more scripts ordered as well. As for actual episode orders, The CW picked-up the back nine for new drama Arrow, so it will have a full season. Fox ordered two more Mindy Project episodes, so now it will be 24 episodes, as that is a vote of confidence since the series has only aired three times to not so great ratings. Stay with us for any further updates on full season pick-ups and cancelations.